Pierre Attendu, President of Systems Division, gives the opening ceremony speech for the new INNOVIA Monorail 300 at InnoTrans. At 12:00 on the opening day of InnoTrans 2014, many visitors attended the opening ceremony of BT’s new monorail, presided over by Pierre Attendu (includes video presentation of the monorail). 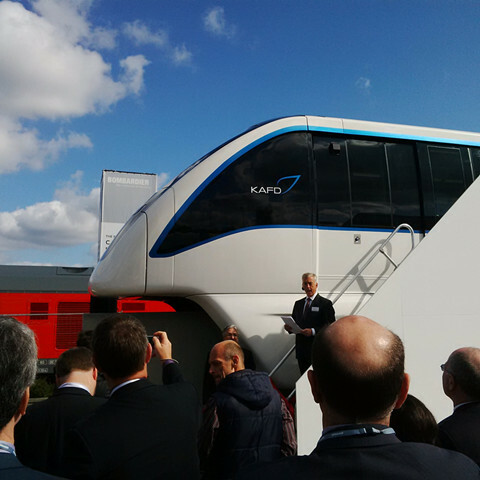 One of the highlights of InnoTrans 2014 in Berlin was BT’s presentation of its new monorail product, the INNOVIA Monorail 300, which marks the first time that a monorail has been exhibited in the history of the fair. Pierre Attendu and BT witnessed hundreds of onlookers and attendees, including media and press agencies along with new INNOVIA Monorail 300 customers, gathering around for his opening speech to officially introduce the monorail to the public at 12:00 on Tuesday. Customers who have placed orders for the monorail include the King Abdullah Financial District (KAFD) in Riyadh, Saudi Arabia, as well as the city of São Paulo in Brazil. The INNOVIA Monorail 300 on display at InnoTrans, a product for the KAFD, is set to continue on to Riyadh after the fair. Attendu stressed the importance of the monorail as a game-changer for urban transport, which is an attractive factor for such rapidly-growing cities as Riyadh and São Paulo. 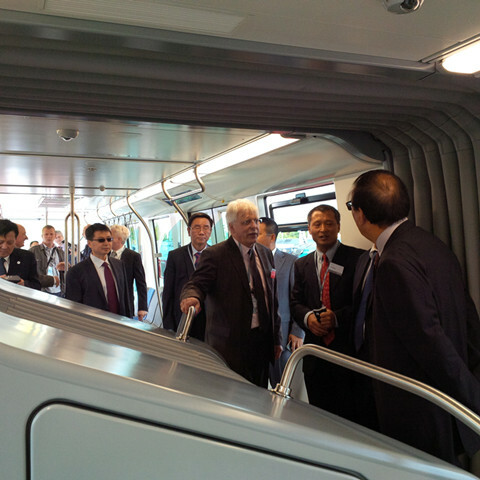 Chinese delegation at InnoTrans views the inside of the INNOVIA Monorail. TheINNOVIA Monorail 300 system is a turnkey transit solution which is fast and cost-efficient to build and maintain, requiring minimal space while still having a sleek design which quietly fits into an urban background. More importantly, the INNOVIA Monorail 300 is a completely driverless system and is the first monorail system in the world that can provide the capacity for delivering mass transit. On top of these points, the INNOVIA Monorail 300 is complemented and supported by some of BT’s most innovative systems and technologies, including CITYFLO 650, communications-based train control system, and the new Permanent Magnet Motor. Bombardier Transportation, a global leader in rail technology, offers the broadest portfolio in the rail industry and delivers innovative products and services that set new standards in sustainable mobility. BOMBARDIER ECO4 technologies – built on the four cornerstones of energy, efficiency, economy and ecology – conserve energy, protect the environment and help to improve total train performance for operators and passengers. Bombardier Transportation is headquartered in Berlin, Germany, and has a very diverse customer base with products or services in more than 60 countries. It has an installed base of over 100,000 vehicles worldwide. Note to Editors For news releases, related material and photos, visit our media center at www.bombardier.com/en/media-centre.html. Follow Bombardier Transportation on Twitter @BombardierRail. BOMBARDIER, FLEXITY, FLEXX, MITRAC, PRIMOVE and ECO4 are trademarks of Bombardier Inc. or its subsidiaries.